It was all about babies and bumps! 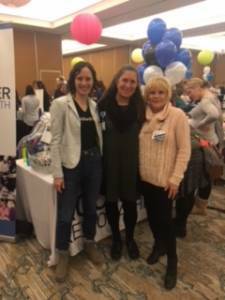 Rochester Regional Health’s Midwifery services participated in the popular Babies and Bumps event on Saturday, April 7 at the DoubleTree Rochester. The event provides women and their partners/family members with information about various prenatal, birth and postpartum services in the Rochester area. All three of RRH’s Midwifery locations were highlighted and they are accepting new patients. Click here for a closer look at the midwive teams. 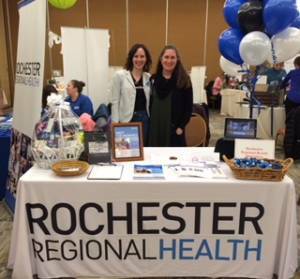 In addition to having a table at the event, two RRH midwives gave a 45-minute seminar on the “Fourth Trimester,” which had more than 50 people in attendance, a “postpartum recovery” basket was raffled off free and there was also a slideshow about giving birth at RGH that continuously attracted a crowd. In the slideshow, attendees enjoyed seeing the birthing rooms at RGH and of course, the jacuzzi! Posted April 11, 2018 under _Featured Stories List, Locations, News, Rochester General Hospital, Weekly Beat.